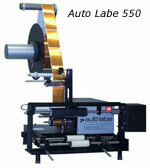 Automatic and semi-automatic, label appliers and printer/applicators, conveyors. Here are a few examples. Call to find out about our wide range of application solutions and prices. From the creators of EASYLABEL®, comes the Tharo PA1000t and PA1000t/b. Easy to Use - The Tharo PA1000t Printer/Applicator requires minimal adjustments allowing quick setup and changeover for applying labels to either the top or side of a product. Rugged - all metal construction low maintenance and precise positioning. Controlled Contact - via the use of springs and an adjustable pressure sensing switch on the Tamp Pad. Easy to Service - With few moving parts, the PA1000t Printer/Applicator is easy to service. Tamp/Blow Option - Applies labels to convex, concave or flat surfaces, on either the top or side of a product. Optional Stand-Alone Capability - The PA1000t also features the ability to work with or without a computer attached. PCMCIA Memory Card - for storing downloadable formats for stand-alone printing. We sell many other models. Call 954-755-4565 for the best prices!